is sorted by age, color, and shape before being assembled into a porcelain “garment.” Although the shards are not altered in any way, they are fitted so closely together into pleasing patterns the finished garments appear to have been designed for their materials. The works open on the sides or back, just like an actual dress or jacket, and can be modeled as if they were of fabric. Born in Hubei, Xiaofeng graduated from Hubei Huanggang Normal College before earning a degree from the Central Academy of Fine Arts in 2002. 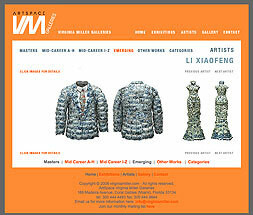 The gallery’s current exhibition, “SAVE AS: Contemporary Chinese Art Born of Ancient Traditions,” is his first exhibition outside the Far East and continues through February 28, 2009. See more artworks here.